Already getting started on your new garden plan for this coming spring? It is never too early to get your lawn and garden ready for the upcoming seasons. At MDM Landscapes, we love helping our community get their lawns prepared and landscapes designed. We keep up on all of the latest gardening trends. Here are the top trends for 2017! Color blocking is using contrasting colors to make a vivid and interesting look. 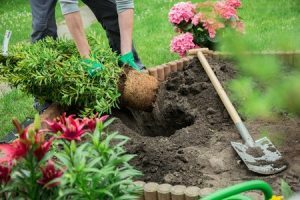 Whether by having contrasting flowers in your garden bed or by adding a splash of color through garden features, this can take your garden to the next level. For the trendy and ecologically minded gardener, finding native plants to your climate is making a comeback. Whether it is to match the changing weather or to bring a touch of local pride to your garden, local sourcing is a great gardening option. Natural stone as a feature or styling option in your garden can give it a style all its own. Natural stone is an ever popular choice for gardens, lending a down to earth feel every time. Traditional or modern? Japanese garden or all roses all the time? The popular thing to do is combine your favorite gardening styles to a unique and beautiful arrangement all your own. This will catch your neighbor’s eye and lend your personal style to your flora. Looking to get your ground ready for your spring garden? MDM provides fertilizer and landscaping solutions for you. Call us today at 817-396-0125 to get started. Posted in Uncategorized on February 6, 2017 at 10:20 pm by MDM Landscapes.